Today, with Office Service Pack 1, we’re announcing that moving forward Power Map will now be native to Excel. No longer a preview add-in, Power Map can now be found on the “Insert” tab in Excel for Office 365 ProPlus customers. Subscription customers will have access to all the new and upcoming features of Power Map, from new types of data visualizations on the Bing map, to new 3-D analysis features, to new ways of storytelling with your “tours”. Power Map allows you to quickly visualize geospatial data that you have already brought into Excel with Power Query and mashed-up with Power Pivot. 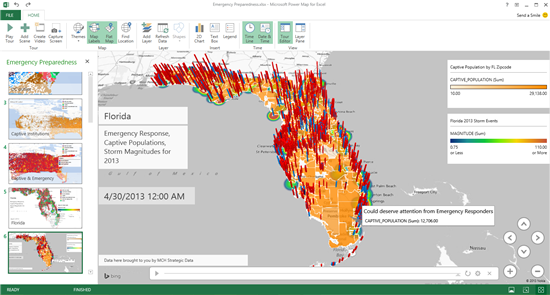 Power Map also provides an immersive 3-D data exploration experience, supplementing the self-service visualization capabilities of Power View dashboards sharable through Power BI for Office 365. Since its research prototype beginnings with WorldWide Telescope, to its public preview in April as the project codename “GeoFlow”, Power Map has continued to introduce the business intelligence community to new ways of interactively exploring their data geospatially in 3-D. For some, it is the initial delight that gets customer’s attention and allows engagement in broader discussions around BI. For others, it is core to what a customer will develop and deliver in a boardroom setting to their management, who might then become extremely engaged in the visualizations – standing up, walking and pointing out key data points in the visual – during the demonstration. What all these Power Map customers have in common is their desire to see their geospatial and temporal data, currently locked in rows and columns, “come to life” in the familiar environment of Excel and then share their insights and stories with others. We will continue to deliver on our mission: To transform data into fluid 3-D stories, unlocking new insights for everyone. The general availability of Power Map is world-wide, with support for all 40 languages that Office supports, and fixes for many numerous usability-hindering bugs we have heard about since the Public Preview rename in September, such as improved abilities to map data across the globe. You can learn more about using Power Map and it’s availability on Office.com. Let us know in the comments what types of data you are visualizing with Power Map and if there are any features we can add over the next few months that will make your tours come to life the map! Map on!